DIY version of the type 9 gearbox mount? Author: Subject: DIY version of the type 9 gearbox mount? I have one like this from my donor, but it looks fairly tired.. The gearbox mount from my donor Sierra was knackered when I built my MK Indy a few years back. Don't have a photo to hand, but IIRC I used a similar looking mount to the one you suggest to mount the tail of my Type 9 gearbox. Worked fine, allowed enough movement, but prevented too much to prevent the gearbox from striking the chasis. IIRC the whole lot cost me sub £10 to source and fit. IIRC the whole lot cost me sub £10 to source and fit. You can see it on this photo. Screwed straight into the gearbox. This is what I used - from Caterham I think. Much stiffer to keep the tail of the gearbox where it should be. Think I might have used the Caterham one as well. I made a new mount, the original mount had gone soft with oil contamination and was allowing the gearbox to hit the chassis. The cortina mount is too tall for the striker tunnel, and a vibratechnics sierra one was 100 quid. It's just some 3&6mm steel sheet folded up in the press with a bit of welding, and some repurposed rollbar link bushes to give some compliance. 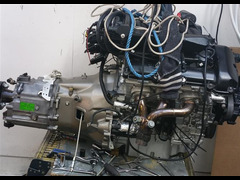 LocostBuilders » Forum » Engine & Transmission » DIY version of the type 9 gearbox mount?